›› To book a cottage, please complete this form. Search our site to check the availability of your desired property. All bookings are made on a first come, first served basis. Your booking will be reserved for seven (7) days, during which time you must complete a rental contract and return it with a deposit. If the contract and deposit have not been received in seven days, the booking is cancelled. No rental agreement is complete until the deposit is received and cashed by Cottage Connections. The balance is due 30 days before the rental period begins and the security deposit is due one week prior to the rental. If you are booking from overseas, wire transfers have an additional $15.00 charge. Once we receive payment in full, we will disclose directions and additional information about the rental property (usually two weeks prior to your arrival date). Payment is by cheque, money order (in Cdn. funds) payable to Cottage Connections Inc. or by Mastercard or Visa. A $25.00 service charge will be levied against payments returned by the bank due to insufficient funds or payments not cleared. Cottage Connections Inc. collects a security deposit on behalf of property owners to ensure compliance with the Terms and Conditions of the Rental Agreement. The security deposit is due one week prior to arrival and is a credit card authorization. The security deposit is held for 15 days, or where applicable, until phone bills/pay per view bills have cleared. All or part of the security deposit may be used for any breakage or damage, long distance or pay per view charges or for any incidents of non-compliance with the rental contract (which may include cleaning costs). All bookings are subject to a $90 administration fee that will be calculated at the time of booking. All bookings made less than 30 days prior to the rental date, must be accompanied with the rent and security deposit in full. In the event of a cancellation by the renter 30 days or less prior to the start of the rental date, the renter will forfeit the full amount of the rental cost. Any cancellation must be in writing to Cottage Connections Inc. 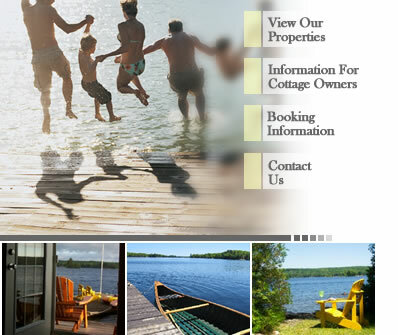 If a cancellation is made 31 days or more prior to the rental date, Cottage Connections shall endeavour to re-rent the property for the period of the original booking. If the company is successful in re-booking, the renter will be reimbursed all original funds paid, less a handling charge equal to 15% of the total amount. If only a portion of the period can be rebooked, Cottage Connections will refund a proportional amount of all money paid less its handling charge. Use of the rental property phone is limited to local calling. All long distance calls must be charged to the renters calling card. Any long distance charges will be deducted from the security deposit along with a $15 service charge per call. Cottage cleaning is not included with the rental. It is the responsibility of the renters to ensure the property is left thoroughly clean and tidy. This means that a thorough cleaning must be done by you and your party prior to departure!! Properties must be left in the condition in which they were found. Please do not leave your garbage behind! All garbage must be taken by you and not left at the cottage! Deductions from your security deposit will result if the above cleaning policy is not adhered to. Although there may be running water,please bring your own drinking water. If you plan on bringing your own watercraft, be sure to advise us on booking. Check the restriction list before booking e.g. pets, smoking, guests, fires, etc.